The best thing any teacher can do is to get to know the parents of learners and to establish ways of keeping regular contact with parents. Building a good relationship with parents/caregivers can be one of the main factors in supporting a child who is experiencing barriers to learning and development. This can be a challenge for busy teachers and parents who have their hands full but, a good teacher-parent partnership can save so much time and it creates the great opportunity for the child to develop to his/her full potential both in school and at home. As part of our Inclusive ECD Centre work, I have the privilege to work closely with teachers and parents/caregivers. 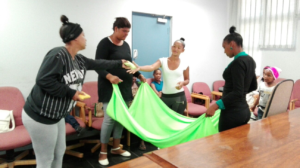 A highlight for me is seeing the wonderful interaction between parents and teachers, playing and learning about ECD together but, most of all I appreciate the cooperation parents offer the centre and each other. In the parent-teacher workshops, we share activities that parents and teachers can introduce/conduct to directly or indirectly support their children’s learning. Parent involvement in early childhood has a number of lifelong benefits such as establishing the importance of education. Parents who are involved in their child’s education create a connection between the home and school. At home, the parent is able to replicate and extend activities that their child experienced at school. By just daily chatting to the child about school, the parent will get a sense of who their child’s friends are, how he/she is getting along in the group as well as pick up where the teacher has left off and this also give the parent an idea of what the parent could work on to increase the child’s competency and confidence. At one of the ECD Centres I’ve worked with intensely for 12-months, Banana Express in Belhar Extension13 the principal highlighted the gap in parent involvement/engagement/cooperation at the school, we’ve discovered that parents feel the only times they are invited to the school is when there is a problem or concern but, I’ve worked intensely on parent partnership, with the result, parents are taking ownership of their school. They are more involved in the school’s activities, they volunteer to help when staff goes on training as well as offer support on school excursion, this helps the staff a lot and parental visits and involvement has had a positive effect on the daily running of the school. Teachers and staff really appreciate the assistance and support.